The Big Bang occurred 13.7 billion years ago, making the Milky Way star HE 1523 the oldest-known star at 13.2 billion years old. The star's age was gleaned from what's left of its radioactive elements compared to stable "anchor" elements, like europium, osmium, and iridium. Long before our solar system formed and even before the Milky Way assumed its final spiral shape, a star slightly smaller than the Sun blazed into life in our galaxy, formed from the newly scattered remains of the first stars in the universe. Employing techniques similar to those used to date archeological remains here on Earth, scientists have learned that a metal-poor star in our Milky Way called HE 1523 is 13.2 billion years old-just slightly younger than 13.7 billion year age of the universe. Our solar system is estimated to be only about 4.6 billion years old. The findings are detailed in the May 10 issue of Astrophysical Journal. Like other early stars, HE 1523 contains very few elements heavier than hydrogen or helium. But it does have some. In particular, it contains radioactive metals such as uranium and thorium, both of which have extremely long half-lives. A radioactive element's half life is the time it takes for one half of the original sample to decay. If scientists know an element's half life and the amount of the original sample, they can estimate an object's age based on how much of the element is left. Uranium and thorium have half-lives of 4.7 billion years and 14 billion years, respectively. "If you know how much there was in the first place-and I'm getting these numbers from theorists-then you take your measurements and off you go," explained study leader Anna Frebel of the University of Texas. This same technique is used with a radioactive form of carbon, called carbon-14, to date fossils rocks and archeological remains. The uranium and thorium in HE 1523 were probably leftover elements from first generation stars that exploded as supernovas and scattered their atomic ashes through space. Second generation stars like HE 1523 formed from those strewn elements. The researchers obtained a high quality light signature of the star by observing it with the European Southern Observatory's Very Large Telescope (VLT) for 7.5 hours. From the star's spectrum, the researchers calculated the amount of uranium and thorium it still contained. Because the uranium and thorium were formed during the supernova explosion of another star, what the researchers really dated was the age of the supernova. But, as Frebel notes, "the time between the supernova and [the birth of HE 1523] is relatively short compared to the age of the star." Scientists are not sure how far away HE 1523 is located, but the star can be seen with the aid of a telescope from the Southern Hemisphere, Frebel said. It is currently a bloated red giant star, and nearing the end of its life, but should still be around for quite a while, she added. While HE 1523 certainly ranks among the oldest stars in the Milky Way, it probably is not the oldest. 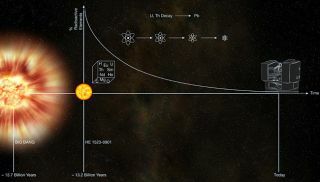 "This star has a certain metallicity by which we measure its chemical primitiveness, but there are other stars out there that are even more primitive in their nature," Frebel told SPACE.com. Scientists think the first stars in the universe formed between 30 and 150 million years after the Big Bang and were massive behemoths, with masses up to 200 times that of our Sun. Scientists think those stellar first born burned brightly and quickly, lasting only a few hundred million years before exhausting their fuels and winking out as black holes or exploding as supernovas. "Massive stars have a much shorter life time than low mass stars," Frebel said. HE 1523 "is probably a 0.8 solar mass star, and that's why it can still survive until today." Recent observations of a supernova 240 million-light years away suggests the explosive star deaths of early stars were fundamentally different from the supernovas of later stars, and that they lasted longer, burned brighter and were fueled by an exotic antimatter engine.